This paper informs the Forum of the School Budget outturn position and an overview of the position on maintained School Balances for the2015/16Financial Year. 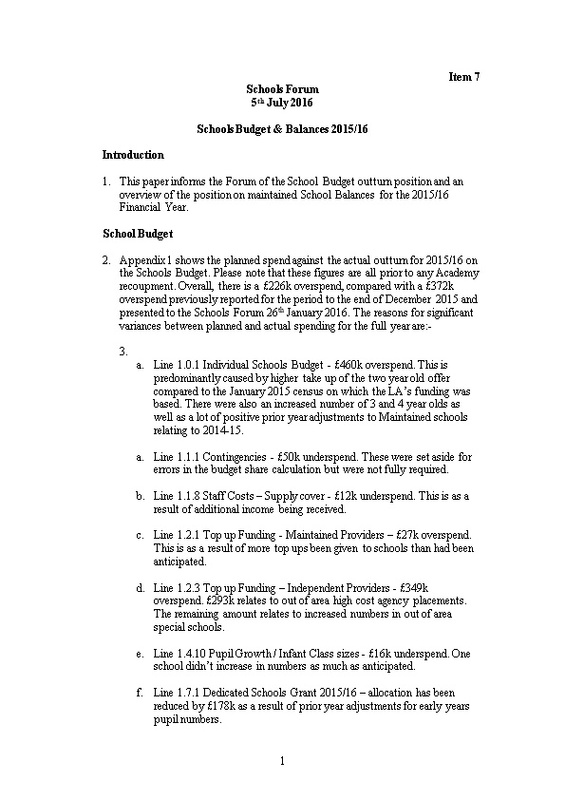 Line 1.0.1 Individual Schools Budget - £460k overspend. This is predominantly caused by higher take up of the two year old offer compared to the January 2015 census on which the LA’s funding was based. There were also an increased number of 3 and 4 year olds as well as a lot of positive prior year adjustments to Maintained schools relating to 2014-15. Line 1.1.1 Contingencies - £50k underspend. These were set aside for errors in the budget share calculation but were not fully required. Line 1.1.8 Staff Costs – Supply cover - £12k underspend. This is as a result of additional income being received. Line 1.2.1 Top up Funding - Maintained Providers – £27k overspend. This is as a resultof more top ups been given to schools than had been anticipated. Line 1.2.3 Top up Funding – Independent Providers - £349koverspend. £293k relates to out of area high cost agency placements. The remaining amount relates to increased numbers in out of area special schools. Line 1.4.10 Pupil Growth / Infant Class sizes - £16k underspend. One school didn’t increase in numbers as much as anticipated. Line 1.7.1 Dedicated Schools Grant 2015/16 – allocation has been reduced by £178k as a result of prior year adjustments for early years pupil numbers. Line 1.7.2 Dedicated Schools Grant brought forward from 2014-15. The £710k underspend relates to the unallocated DSG carry forward that was not earmarked by the School’s Forum in July 2015 but is now funding what would be an otherwise greater overspend. As provided in January, Appendix 1 is in a slightly different format to previous years. This has been done in order to still maintain the original budget position that was agreed by the Schools Forum, but at the same time two extra columns have been created to illustrate changes to the budget and subsequently a revised budget. These adjustments are explained in the notes at the bottom of the appendix. The £226k overspend against the 2015-16 DSG is after the total historic carry forward balance of £1.318m has been drawn down from the DSG reserve meaning the reserve now stands at nil. £105k allocated to project initiatives for increasing take up of 2 year oldswhich have not been spent in 2015/16 but which are earmarked. The remaining sum of £39k will remain unallocated. Overall maintained school balances stand at £5.3m and have reduced by £140k meaning schools balances still equate to around 6% of the annual Individual Schools Budget.Balances have reduced by £440k as a result of 4 schools converting to Academy status during 2015-16, meaning schools that were LA Maintained as at 31st March 2016, when taken collectively, have actually increased their balancesby £300k. On prima facie evidence there are two secondary and fourteen primary schools holding excess surplus balances ie. with balances above the 5% and 8% thresholds respectively. This compares with 16 schools (2 secondaries and 14 primaries) holding balances above the thresholds at the end of 2014/15. For 2015/16 all schools with excess surplusbalances had applied for and received permission to hold these. At 31st March 2016 there was one school with a deficit below £10k which compares to none in the previous year. The school plan to repay the deficit in full in the current financial year. The Schools Forum is asked to note the position for 2015-16.